The Colorado Rockies clinched a spot in baseball’s postseason by defeating the Washington Nationals 5-2 Friday night, the first time in franchise history the Rockies have reached the playoffs in two straight years. Even though they were eliminated from postseason contention, the Nationals did not just roll over for the Rockies. Washington opened the game by pressing Rockies’ starting pitcher Kyle Freeland with base hits in each of the first three innings. While Freeland did not have the best command of his pitches, he managed to keep his composure to deliver a strong start in a crucial game. A defining moment of Freeland’s outing came in the top of the third inning with no runs on the scoreboard. Freeland found himself in a bit of pickle with the bases loaded and two outs with former Rockies first baseman Mark Reynolds at the plate. Freeland worked a full-count against his former teammate before delivering a high fastball that Reynolds swang through and missed to preserve the 0-0 score and escape what could have been a disaster for Colorado. Finally, in the bottom of the third inning, the Rockies scored the first run of the ballgame when Charlie Blackmon hit a solo home run to right field, his 28th of the season. Freeland was unable to keep the lead for Colorado as the Nationals went on to score two runs off of him in the top half of the fourth inning. They would be the only runs of the ballgame from that point for Washington. Carlos Gonzalez reached base on an infield single to start the bottom of the fifth inning and quickly found himself at home following a two-run home run off the bat of Ian Desmond. Next up, veteran catcher Chris Iannetta blasted a home run to center field, establishing a 4-2 lead. It was the fifth time this season that the Rockies hit back-to-back home runs. 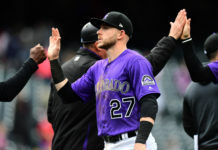 David Dahl added some insurance to the Rockies lead in the sixth inning where he hit a towering home run to right field. The long ball was the 15th of the season for Dahl and his fifth consecutive game with a home run, joining Rockies’ legends Dante Bichette, Larry Walker, and Nolan Arenado. Freeland managed to get through six innings, allowing 11 hits while surrendering two runs and striking out four batters. Freeland, the Denver native, finished the year with a 2.85 ERA, which the lowest ERA in a full season from a Rockies’ starting pitcher. His 2.40 ERA at home was also the lowest mark in franchise history. It’s an historic and extraordinary night for the Rockies, indeed, in a season which has been one to remember. Next stop, the 2018 playoffs. With two more wins, Colorado will clinch the NL West for the first time ever. That would push their current win streak to 10 games. At the very least, they’ll be in the play-in game.